William F. Garvin, Cheyenne, Wyoming, c1890. WHS Collections 2013.18.1. All images gifts of Bev Garvan. 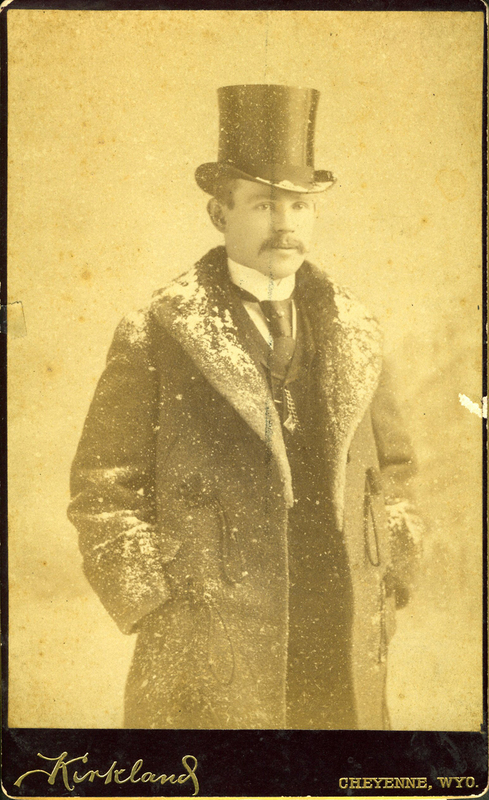 William F. Garvin (1862-1900), born and raised in Windsor, left his home and family and headed to Denver in October of 1883, one month short of his 21st birthday. The western climate eased his asthma, and he soon found work with M. Marks, proprietor of a dry goods and men’s clothing store in Cheyenne, Wyoming. Cheyenne was a young and rapidly growing frontier town in the late 1800s. Massive herds of cattle arrived at the Cheyenne railhead, and there were several military posts nearby. 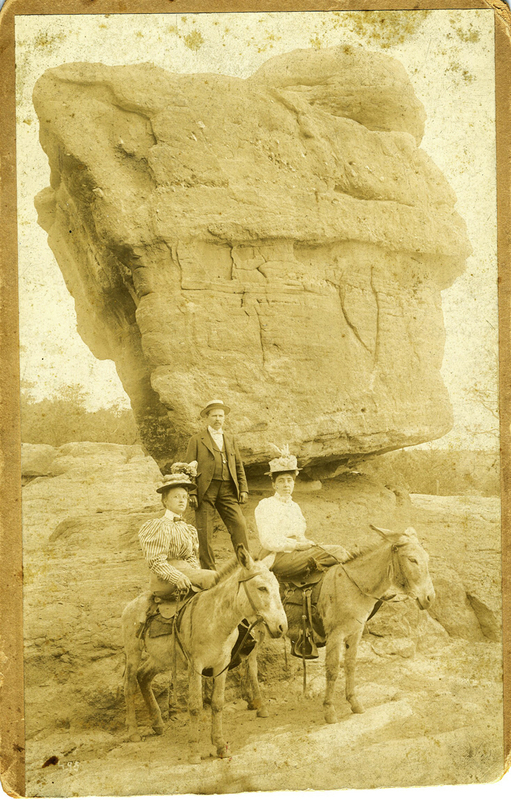 William enjoyed many of the popular activities of the era: baseball, horse racing, politics, and excursions to the mountains. He faithfully wrote each week to his younger brother John back in Windsor. John provided family news and William shared stories of the Wild West and the exciting opportunities open to a young man with promise. 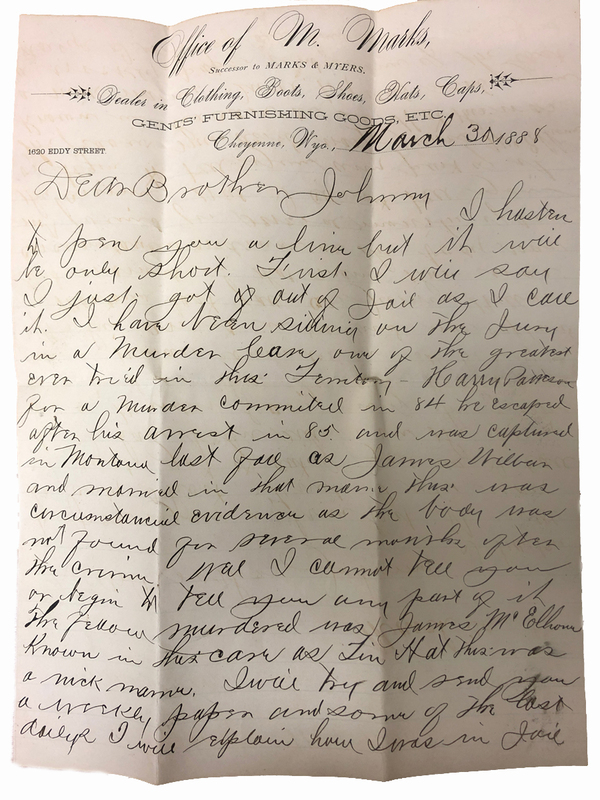 In 2013, William’s grandniece Bev Garvan donated this collection of 300 letters to the Society. 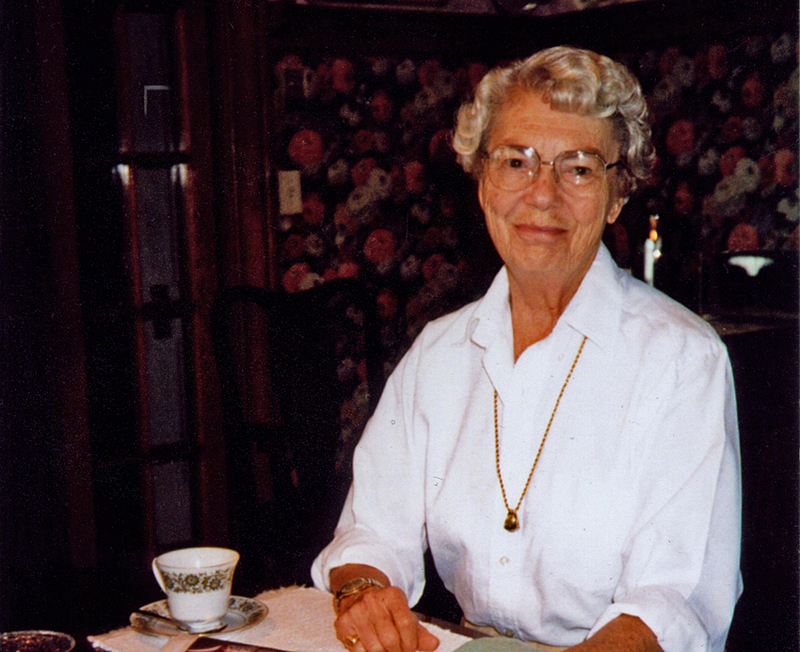 She has transcribed dozens of excerpts from the letters to illustrate some of the differences between life in Windsor and in the West. Oct. 12, 1883 I have arrived at Chicago tonight. I felt very bad at starting but I thought it is all for the good. I don’t tell Mother not to worry or fret. I know it is hard but this world is full of trouble. The trip is very delightful and I enjoyed myself. The scenery is magnificent. Nov. 16, 1883 It is a month from the time I left home. I have not been homesick yet. When I read your letters I some times feel blue but I then thank God for the wonderful improvement in my health. Mar. 4, 1884 Received an offer of work from Marks & Myers in Cheyenne for $75 a month. They sell Dry and Fancy goods, clothing (hats, caps, boots, shoes, etc.). 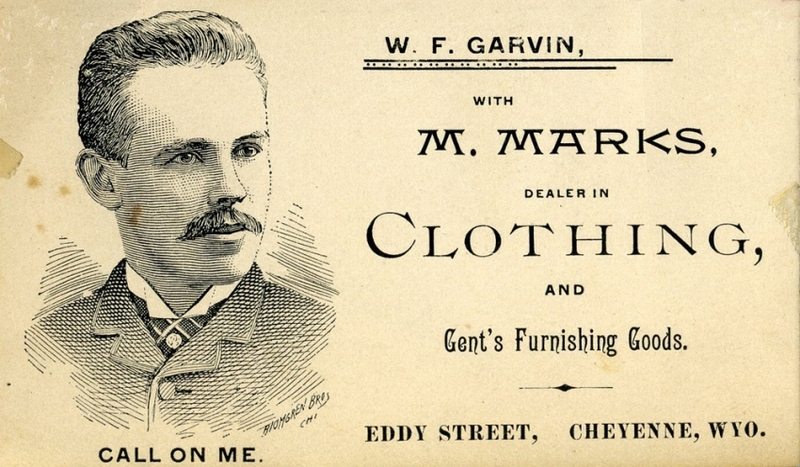 William Garvin’s business card, c 1884-1900. WHS collections 2013.18.10. Mar. 30, 1884 I am in Cheyenne and am well. Have a large room with two beds and furnished by the house so as to have someone sleep in the store. This is a great town but much different from Denver. Have been furnishing about 20 cowboys with blankets, shirts, boots, etc. as they are starting out today to the Plains with their teams. You should see their old, big wagons loaded so heavily with goods. They have 8 mules on each team. They will be gone for probably 6 months. May 4, 1884 Good women are scarce in this town. There are plenty of one kind but a d___ poor kind. Guess I will stop about women as I am afraid I would shake up your modesty, as I am sure it is good. Aug. 24, 1884 Yesterday we had about 50 Mexicans come in on what is called The Trail. This is the way they bring the cattle from Texas. These men are 6 months on the road and bring thousands and thousands of head. Sept. 21, 1884 I suppose you are all excited about the Presidential campaign especially Father. As you no doubt know although I am 21 years I have not the right to vote as I am now in a Territory. I think very little of [Grover] Cleveland. Nov. 7, 1884 This morning’s news tells me that the Hon. Grover Cleveland is to be our next President. I continue to tell everyone that there is a young man, my brother, who will beat the drum tonight for all it is worth. It was quite a sight to see elections here and to see all the women voting. I did not sell my vote for I have more manly principals. Feb. 7, 1885 Went to a masquerade last week. Had a high silk plug hat, a linen duster, cane and mask and no one knew me. I had a big time. July 24, 1885 I am going on a business and pleasure trip a way up among the Rocky Mountains about 85 miles off from the railroad to a place called Twin Mountains. I will take a good gun and should I see a red skin or Indian as you call them, I will be fixed for him. I have a new girl now and am a dandy she says. Aug. 23, 1885 I am living good. I am now at the Fisher Hotel — a new one and it is grand and everything is served to the Queen’s taste. Oh Johnny this is the country to find the smart men and ones that know how to do business and this is why Cheyenne is a prosperous city. Dec. 6, 1885 Christmas is almost at hand and I can hardly imagine it. I wish you would send me news of Old Windsor. Shooting is nothing here and the fear now is that we will have a necktie party soon for they will hang these fellows if they are not well guarded. I have a 42 caliber in my pocket every day. 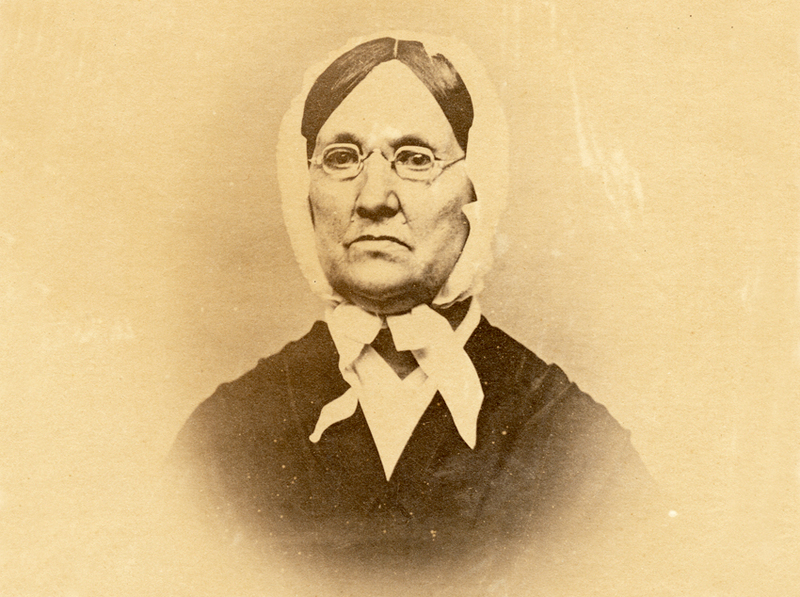 Dec. 27, 1885 I write today to thank Dear Mother for her present. I have many silk handkerchiefs but this one brought tears to my eyes and I think she would wish that I am wearing it today in my coat pocket. Sept. 1, 1886 We have big excitement here as we have a new R.R. started for central Wyoming. There are 2,000 people there in tents and will soon have a large town called Douglas. The first lots sold were on the 31st of Aug. and I and my partner M. Frank have invested in a new lot should I go into business. I hope it will be a good speculation. July 22, 1887 All of you must be lonesome without me but you know it is best that I do not live in Connecticut. I had a pleasant journey home and made some interesting company. I am back to work and all my cowboys are asking for me. Aug. 30, 1887 I have a new scheme – how would you like to come out West and work your way up? There is a new town up at the Chicago & Northwestern Railway called Uva which has bright prospects. I would get a piece of property and build a store and have you run it for me. I would keep my position here and assist you in buying and getting credit. Can you spare $200 for the lot? Sept. 13, 1887 In regard to Uva I will not do anything this fall. Can do as well in the spring. 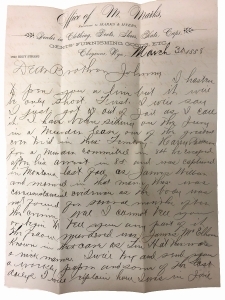 Letter from William to his brother John Garvin, March 30, 1888. WHS collections 2013.18.7. Aug. 14, 1888 Went on a picnic last Sunday 16 miles South to National Fort. This is a fine place, very wild and not fixed up any. I played a game of ball last Friday in which we won. I am noted for a heavy hitter and made a three bagger last game. Oct. 17, 1888 I have a girl here now that is a Dandy. The 25th of this month is my birthday and today she handed me my present. A fine gold watch chain with 13 diamond stones in it and it cost $75. What do you think of such a thing. She is good and has the money to spare. I only hope I can hold her but it may not be my lot. I am getting full of diamonds, as you know. I have a diamond ring too. Nov. 8, 1889 Election time was busy. We had a great fight for the Constitution and Statehood. We endorsed the Constitution and now must wait and see what Congress will do with us. July 8, 1890 I mailed you a statehood paper where we got the news of the bill passing the Senate (we had a great night). Now when the President signs we will have our 4th of July and then when our Senator returns from Washington it is nothing but hurrah for Statehood! Jan. 8, 1892 The sad sad news came to my hand this morning. I cannot explain my feeling. You should have telegraphed me of Father’s death at once. March 27, 1892 I am getting to be a politician. We held our Democratic primaries last evening and I am a delegate to the County convention. I am in hopes to go to the State convention. Mar. 28, 1892 In regard to my coming home this spring I am somewhat undecided at present. I guess I can get away and I assure you I am anxious but I have been thinking if I can put it off for a year I can go and at the same time take in the World’s Fair at Chicago. William’s mother and the rest of the family frequently urged him to come back east for a visit. He did go home in 1887 and again in August 1893, stopping on his return to see the astounding sights at the Chicago World’s Fair.